How is SCIM data stored? SCIM is a specification designed to reduce the complexity of user management operations by providing a common user schema and the patterns for exchanging such schema using HTTP in a platform-neutral fashion. The aim of SCIM is achieving interoperability, security, and scalability in the context of identity management. Developers can think of SCIM merely as a REST API with endpoints exposing CRUD functionality (create, read, update and delete). For your reference, the current version of the standard is governed by the following documents: RFC 7642, RFC 7643, and RFC 7644. Clearly, this API must not be anonymously accessed. However, the basic SCIM standard does not define a specific mechanism to prevent unauthorized requests to endpoints. There are just a few guidelines in section 2 of RFC 7644 concerned with authentication and authorization. Gluu Server CE allows you to protect your endpoints with UMA (a profile of OAuth 2.0). This is a safe and standardized approach for controlling access to web resources. For SCIM protection, we strongly recommend its usage. Alternatively, for testing purposes you can temporarily enable the test mode. In this mode, some complexity is taken out so that it serves as a quick and easy way to start interacting with your service, as well as learning about SCIM. To exit test mode, just set scimTestMode back to false and then click the Save Configuration button. Test mode provides little security to protect your service. The way this feature operates in Gluu Server can change in future releases. In this step, we will create an OpenId Connect client that will allow us to request valid access tokens to interact with the service. There are two ways to create a client. One consists of issuing an HTTP POST to the already existing client registration endpoint of your Gluu Server and parsing the received response. Another, more end-user oriented approach is via oxTrust. If you want to follow the first approach (direct interaction with registration endpoint), locate its endpoint URL by visiting https://<your-gluu-host>/.well-known/openid-configuration and inspect the property registration_endpoint. 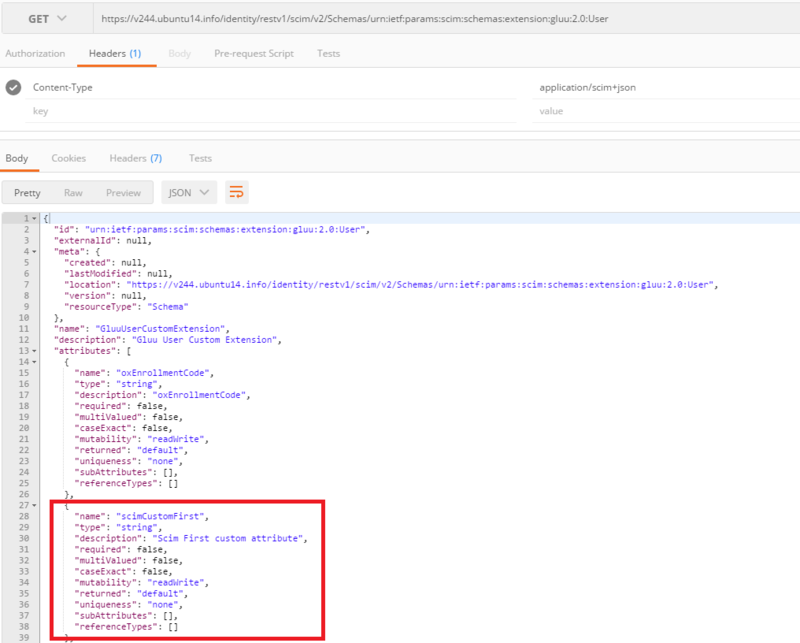 To know how to structure a payload, refer to section 3 of the OpenID Connect Dynamic Client Registration 1.0 spec. This section requires basic knowledge of HTTP at programming or scripting (eg. bash) level. If you have problems creating your request, see section 4.4.2 of OAuth 2.0 for a deeper insight. Once the POST is executed you will get a response from server in Json format. Validate you are receiving a successful response (HTTP code 200). If something went wrong (malformed request), you will see a bad request error (HTTP code 400). Extract the access token from the response. Now, you can start interacting with your service! To know the protocol, ie. the endpoints available in the service and the information those endpoints accept as input and return as output, see the protocol spec. However, to make it easier for you, we have compiled some representative examples of CRUD (create, read, update and delete) with SCIM in the section Raw HTTP requests that you may see at a later time. For now, start with a basic query: say we need to find the users whose userName contains the sequence of letters "mi". After execution, you will get JSON content with the results matching the criteria (at most 10 items). Always pay attention to the HTTP response code. If you are getting 401, ie. unauthorized, your token may have expired. If that's the case, proceed to the next section immediately to learn how to cope with this situation. Remember that in section Raw HTTP requests below, there are more curl examples on how to interact with SCIM endpoints. An access token lifetime is around 5 minutes, so after a short period you will start getting a small JSON response saying you are not authorized (HTTP 401) for all subsequent invocations made. This means it's time to request for a newer token. To do this, just do the same as in this section above where we were issued the access token for the first time. Extract the token from the response and you can continue playing around with the SCIM API endpoints. To request an access token, the OpenId client acting on your behalf must be current: its password expiration also counts. Update your client expiration or create a new client if necessary. Just proceed as you did the first time. Versions 3.0.x and earlier employed a (very) long-lived OAuth2 access token to send requests to the service. The current Gluu server uses a safer short-lived token approach in combination with an OpenId Connect client. That token was previously passed as an extra query parameter. We have changed this to using the Authorization header, which is a more standard and safer practice. If you are still interested in how the older approach worked, visit the 3.0.2 page. In version 3.1.0 onwards the root endpoint has been shortened: now, your service is exposed at https://<your-host>/identity/restv1/scim/v2/. To lower the barrier to start with SCIM, some raw HTTP sample requests are presented throughout this section. These requests exemplify how to do very basic CRUD on SCIM resources. While only users are covered, you can extrapolate to groups and other kind of resources if any. If you are a Java developer, you already have at your disposal a library to interact with your SCIM endpoints so there is no need to craft requests by hand. Examples shown here cover very little of what's possible to achieve with the SCIM REST API. For more involved or advanced use cases, you may like to glance at the spec. The SCIM API page offers a condensed and more readable reference to compose your requests. This new user has been given an id. If possible, inspect your ou=people branch and find the entry whose inum matches the id given. An easier option would be to log in via oxTrust and go to Users > Manage People and search "Joe" to see the recently created user. Please note that SCIM will only allow you to create users with HTTP POST verb. In the Gluu Server, inums are long strings consisting of alphanumeric characters and typically start with @!, include these two characters as well. Note that the URL was surrounded with single quotes: bang characters might be misleading to your command line interpreter. The SCIM protocol defines a standard set of parameters that can be used to filter, sort, and paginate resources in a query response (see section 3.4.3 of RFC 7644). Filtering capabilities are very rich and enable developers to build complex queries. So let's elaborate a bit more on the example already shown in the test mode section: let's create a query to return the first 2 users whose userName contains the sequence of letters "mi". Results should be sorted alphabetically by givenName. The SCIM spec defines two ways to update resources: HTTP PUT and PATCH. Response (output.json) will show the same contents of a full retrieval. Please verify changes were applied whether by inspecting LDAP or issuing a GET. If you have followed the steps properly, you should notice a new e-mail added and the change in displayName attribute. With patching, you can be very precise about the modifications you want to apply. Patching syntax follows JSON Patch spec (RFC 6902) closely. While it's not a must to read the RFC to learn how patch works, see section 3.5.2 of SCIM protocol (RFC 7644) to get the grasp. If you prefer reading code, patch test cases found in the Java SCIM-Client project are worth to look at. A collection of modification are provided under "Operations". They are processed in order of appearance. Also, every operation has a type; patching supports add, remove and replace. The first operations states the following: replace the value of givenName subattribute (that belongs to complex attribute name) with the string "Joey". Operations are easier to understand when using a "path". The second operation replaces the value subattribute inside the complex multi-valued attribute emails. Inside the square brackets, we find a filter expression, so the replacement does not apply to all emails in the list but only to those matching the criterion. So the second operation can be read as "set the value of value subattribute to string jsmith@example.com where the type subattribute of the email equals to string "work" or if primary attribute is false". The third operation is similar to the first. It sets the value of a subattribute which was unassigned (null). You could have used "replace" operation in this case and results would have been identical. The fourth operation is more interesting. It adds to the current list of emails a new one. It supplies a couple of subattributes for the email to include: primary and value. Additionally, we set the value of (previously unassigned) phoneNumbers multi-valued attribute passing a list of elements. In the fifth operation, we remove the middleName attribute that was set in operation three. Note how we make explicit the path of data to nullify: "name.middleName". The sixth operation allows us to remove a specific subattribute of phoneNumbers. The aim is to nullify the "type" of the item whose phone number value ends with "01". The remove operation can also be used to remove a complete item from a list, or empty the whole list by providing a suitable value for "path". Note the primary subattribute accompanying email "my@own.mail" is false but when inserted we provided true. This is because the SCIM specification states that after modifications are applied to resources (PUT or PATCH), there cannot be more than one item in a multi-valued attribute with primary value set as true. To see more sample JSON payloads, check the .json files used by the SCIM-Client test cases referenced above. In conjunction with bulk operations, patch becomes a very powerful tool to transform data. For deleting, the DELETE method of HTTP is used. Use the inum of our dummy user, Average Joe. Check your LDAP or via oxTrust to see that Joe is gone. If you code in Java, you can take advantage of the ready-to-use client library SCIM-Client developed by Gluu. With this client, you will be able to interact with your SCIM endpoints with no need to craft requests by hand, creating clients or requesting/refreshing access tokens. You can even use the client when your endpoints are protected by UMA: all authorization steps are handled for you. Ideally, the SCIM-Client you use should match your Gluu version. For example, if you are running Gluu Server CE v3.1.6, you should also use SCIM-Client v3.1.6. If you don't want to use Maven, you can download the jar file for SCIM-Client here: https://ox.gluu.org/maven/gluu/scim/client/SCIM-Client. This may require you to add other libraries (jar files dependencies) manually. The first line of method simpleSearch is getting an object that conforms to the ClientSideService interface. This interface is a "mashup" of several interfaces and gives access to a rich number of methods that will allow you to do all CRUD you may need. Other methods in ScimClientFactory class allow to supply a specific interface class and so get an object that adheres to that interface. Create a main method for class TestScimClient and call simpleSearch from there. When running, you will see the output of retrieving one user (admin) and see his displayName on the screen or wherever you have configured your logs to be written to. Here we are using log4j2 as framework, but you may use the any other logging framework. Note the usage of close in the last statement. While it's not a requirement, it is recommended to call close whenever you know there will not be any other request associated to the client you obtained. The SCIM protected by UMA section contains examples for adding and deleting users. The only actual difference in coding for test mode or UMA-protected service is the way in which you initially get a ScimClient object instance. For test mode, just call ScimClientFactory.getTestClient as shown in the previous example. When running your code in test mode, some new OpenID clients are created (they are employed to request short-lived tokens to access the service). 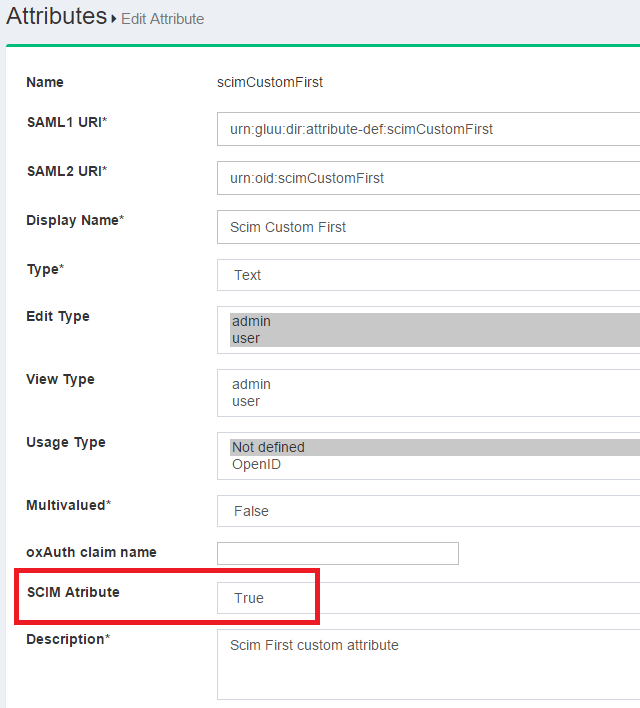 In oxTrust, you can see those by navigating to OpenId Connect > Clients; they are named as "SCIM-Client". These clients won't clutter your LDAP, they are also short-lived (one day) so they are cleaned up automatically. scim-client2 project uses the JAX-RS 2.0 Client API and RestEasy framework. Under the hood network communication between client and server is handled by HttpClient from the Apache HttpComponents project which by default makes use of org.apache.http.impl.conn.SingleClientConnManager. This connection manager manipulates a single socket at any given time and supports the use case in which one or more invocations are made serially from a single thread. The above means that by default, instances obtained via ScimClientFactory do not support concurrent calls in a safe manner. We added multithread support by employing the thread safe connection manager org.apache.http.impl.conn.PoolingHttpClientConnectionManager. You need to explicitly enable this feature, otherwise, behavior will be standard (single execution thread per client instance). You will have to supply proper parameters to better suit your production environment needs. Set a Java variable of name httpclient.multithreaded with any value. This will make the scim-client2 use the PoolingHttpClientConnectionManager. To override the default maximum number of total connections the manager uses, supply variable httpclient.multithreaded.maxtotal with the value of your choosing. To override the default maximum number of connections per route, supply variable httpclient.multithreaded.maxperroute. To override the validate-after-inactivity period in milliseconds, supply variable httpclient.multithreaded.validateafterinactivity. IMPORTANT: Check RPT connection pooling is enabled in oxTrust. Login to oxTrust and go to Configuration > JSON Configuration. Scroll down to rptConnectionPoolUseConnectionPooling and set the flag to true. To finish press Save configuration at the bottom of the page. User-managed access (UMA) is a profile of OAuth2.0 and is focused on defining standardized flows and constructs for coordinating the protection of an API or existing web resource. For more information on UMA please visit the corresponding page in the docs - the specification can be found at the Kantara website. Gluu Server CE supports UMA protection for SCIM endpoints from version 2.4.0 onwards. This functionality is built-in and does not require any special package or installation. Gluu server 3.1.0 and later supports UMA 2.0 - the latest version of the standard. UMA 1.0.1 is not supported any longer. This section condenses some important concepts of UMA. It's good to familiarize yourself with the different parties interacting in the process, namely a resource owner, a client, a resource server and an authorization server. Now you may have a richer perspective of what the protection process entails, so let's proceed with a real setup. The following instructions show how to interact with the UMA-protected SCIM service using the SCIM-Client Java library. Ideally the SCIM-Client you use should match your Gluu version. For example, if you are running Gluu Server CE v3.1.6, you should also use SCIM-Client v3.1.6. You can supply an alias from scim-rp.jks for umaClientKeyId. The first key from the file is used automatically when this value is left empty. Create a main method for class TestScimClient and call simpleSearch from there. When running, you will see the output of retrieving one user (admin) and see his displayName on the screen. Here, backslashes "\" allow us to span the contents across several lines. You may also use an "objectual" approach to dealing with users. The following code snippet employs the class org.gluu.oxtrust.model.scim2.User of SCIM-Client. To delete a user, only his ID (the inum LDAP attribute) is needed. You can see the id of the user just created by inspecting the JSON response. Coding service interactions when SCIM endpoints are being protected by UMA is more involved than using test mode. If you are planning to code for a SCIM service protected by UMA, it is advisable to check the flow depicted in section 3 of the UMA 2.0 spec. Focus only on the interactions of client vs. another party (resource server or authorization server). In a previous section, we talked about the actors involved in UMA protection; this will save you time when reading the specification. As a guideline for your own implementation, you can take ideas from the Java class UmaScimClient found in SCIM-Client. Starting at the authorize method, you will see how steps in the spec flow are being followed there. Check the metadata URL of UMA 2 to discover the oxAuth endpoint that issues tokens. Visit https://<host-name>/.well-known/uma2-configuration. RFC 7643 defines the schema for resource types in SCIM (see section 3.3). In other words, it defines structures in terms of attributes to represent users and groups as well as attribute types, mutability, cardinality, and so on. Please visit this page for a more detailed explanation. When registering the attribute in the admin GUI, please ensure you have set the SCIM Attribute parameter to true. Only the following data types for extended attributes are supported in SCIM server implementation: string, numeric, and date. In the JSON response, your new added attribute will appear. To access the name/values of custom attributes please use the getCustomAttributes method of your SCIM resource and pass the URI of the extension that these custom attributes are associated to. Likewise, to set the values for your custom attributes, call the addCustomAttributes and pass a CustomAttributes instance. The following snippet sends a user creation request and shows how to check if the status code is appropriate. If not, the error details are parsed using the ErrorResponse class. Former SCIM-Client versions used to deal with BaseClientResponse<T> objects and it was not possible to read the entity as an instance of a class other than T (usually T being User or Group) because the response was already fully consumed. This usually led to errors like "Stream closed". Newer client allows you to read the response as many times as you need without restriction of type parameter T as the underlying response stream is buffered by default. SCIM standard is concerned with two types of resources, namely, Users and Groups. However, according to spec, the service can be extended to add new resource types. Particularly, Gluu Server implementation of SCIM contains a resource type called "FIDO device". A FIDO device represents a user credential stored in the Gluu Server LDAP that is compliant with the FIDO U2F authentication standard. These devices are used as a second factor in a setting of strong authentication. Examples of FIDO devices are u2f security keys and Super Gluu devices. Having FIDO devices as one of resource types allow application developers querying, updating and deleting already existing (added) devices. Addition of devices do not take place through the service since this process requires direct end-user interaction, ie. device enrolling. Fido 2 devices are not accessible by current SCIM implementation. Given the nature of this resource, most of its attributes are not modifiable. Editing is limited to the following attributes: displayName and description. The following subsection shows an example of FIDO device retrieval using filters. SCIM schema spec does not use LDAP attribute names but a different naming convention for resource attributes. The following table lists the core SCIM attributes and their corresponding LDAP destination attributes. Note this is not the case of custom attributes where the SCIM name used is that of the LDAP attribute. SCIM service has many use cases. One interesting and often arising is that of coding your own user registration process. With your SCIM endpoints you can build a custom application to enter users to your LDAP directory. Shape your data model early. List the attributes your application will operate upon and correlate with those found in the SCIM user schema. You can learn about the schema in RFC 7644. At least, take a look at the JSON-formatted schema that your Gluu Server shows: visit https://<host-name>/identity/restv1/scim/v2/Schemas/urn:ietf:params:scim:schemas:core:2.0:User. You will have to check your LDAP contents very often as you develop and run tests. You may have to delete attributes or whole entries as your application evolves. Thus, use a suitable tool for LDAP manipulation: Use oxTrust to manipulate your users' attributes or setup a LDAP GUI client to have more control. Always check your logs. In (test mode)[#working-in-test-mode] section above you can find some guidelines in this regard. In this user management guide with SCIM, we have already touched upon the fundamentals of SCIM in Gluu Server and shown a good amount of sample requests for manipulation of user information. However, keep in mind the SCIM spec documents are definitely the key reference to build working request messages, specially RFC 7643, and RFC 7644. In this section, we will summarize the tasks you need to undertake in order to code your application. We will not go into details of any programming language or technology to build user interfaces. This task has to do with creating utility code that will allow you to obtain tokens (whether an "access token" for test mode or a "requesting party token" - rpt - when using UMA). This code requires sending HTTPS requests to a few URLs. In previous sections, we covered thoroughly what needs to be done for test mode for UMA basic guidelines were given. Ensure you have already enabled the protection for your preference in oxTrust. To test your authorization code, use a simple GET retrieval request. Use the information given in the section Creating resources to make a hardcoded POST to the user endpoint. Design your form according to the set of attributes you are targeting. Keep it as simple as possible and include enhancements only after you are seeing progress. Develop the code required to take the data entered in the fields of your form to build up a JSON structure the service can understand. Ensure your code creates well-formed JSON in all cases. A good number of errors stem from the fact the payload cannot be parsed by the service implementation. While testing, it's important to compare that you are receiving in the body the contents you have sent. You will additionally receive other valuable information such as the creation timestamp. Create a success/failure page that shows the result of the operation based on the response received. With your now-working application, do the adjustments to include attributes that may enrich your process. A common attribute could be status. This attribute (that maps to LDAP attribute gluuStatus) determines whether your created user is active or not. Polish your form and add mechanisms to prevent abuse - a malicious user may end up creating lots of dummy entries. Add validations, captchas, etc. that may control indiscriminate submissions.